Why do some kids try to become the so-called “alpha dogs” of their families? The answer lies in an old saying: Nature abhors a vacuum. And in my experience, if there’s a vacuum of power in a family, somebody’s going to try to fill it. Understand that some mature, older kids do gain some authority in their families, and that’s natural. In fact, it works well when you have a very responsible, “adultified” child. Often, the oldest child in a family will take on a leadership role among his siblings. And when that child has a pretty good balance of behavior, he will try to follow through on house rules; his behavior usually won’t pose a problem. But if a child doesn’t have that balance or maturity, or if the parents aren’t clearly in control of the family structure, it’s another story altogether. Some kids will start to compete with their parents for power from an early age. Instead of following through on the adults’ wishes, they’ll be more interested in controlling their siblings and calling all the shots in the house. In other words, they will start filling that vacuum. Sometimes the vacuum in parental authority exists because of work and school schedules. In families today where both parents often work, there are frequently times when kids are left under the care of older siblings. A gap is then created which a certain kind of child will fill. And if the child has his own negative intentions, he’ll have plenty of time without adult supervision to intimidate and manipulate the other kids in the family. He will use this time to go against his parents’ wishes and play the big shot. He might give his younger siblings ice cream after school, for example, even though it’s against the rules. Or he may intimidate them when it’s their turn to go on the computer, so he can stay on as long as he wants. And when you get home, if his younger siblings tattle on this child, he’ll get them back the next day. This means that for the other children in your family, there is no safety. It becomes very easy for your dominant child to control the family from here on out. Parents are often initially afraid to stand up to a child who’s bossing everyone around. This might be because there’s been a parenting gap all the while, or because they depend on this child to supervise the other kids when they’re gone. But if they avoid talking to their dominant child about this, they will soon see a shift in the balance of power. At some point, their younger kids will surmise that the adults cannot protect them from their “bossy” sibling. Once the younger kids believe they aren’t safe, then they have to make their own separate deals with that sibling. And that deal usually involves giving in to him and following his lead. When this happens, you’ll see all kinds of inappropriate behavior begin to blossom and thrive. Sometimes these “alpha dog” kids are funny, so they become clowns and make unkind jokes at their parents’ expense. By the way, I’m not talking about a child who makes a harmless joke, I’m talking about one who will put his parents down and make demeaning comments about them. His siblings laugh at those jokes because they’re more afraid of his power than they are of their parents’ authority. And why shouldn’t they be? When this dynamic is controlling a family, the dominant child is much more powerful and has a greater impact on their lives than the parents do. As things build to a head, the parents feel less and less in control and more and more perplexed and overwhelmed by what’s happening. Often, they are not really sure what to do. A family in this situation has really hit a level where they aren’t functioning in a healthy way anymore. I would then sit down with them and come up with a plan to help them take the power out of their child’s hands and put it back into theirs—where it belongs in any healthy family structure. You have to set limits on any child who is trying to run the family and hold him accountable. Parents are afraid that if they say, “Go to your room,” their dominant child will say, “Screw you!” So those parents might think they’ll look powerless in front of their other kids when this child refuses to comply. But here’s the rub: If your other kids see you direct your child to his room and he refuses, they know that their brother has the problem. Conversely, if your child does something inappropriate and you don’t give him any consequences, you’re really going to look powerless. In other words, if you tell him to go to his room and he says “No, I’m not going—and you can’t make me,” you actually look powerful to your other kids. Your acting-out child looks primitive and wrong when he defies you. The other kids know where he’s supposed to go, and even if he refuses, they still see you being the parent. If you try to avoid a scene because you’re afraid you’re going to lose face, what tends to happen is that your child will slowly gain more and more power, and that will be confusing to your younger kids. I’ve found that the gut reactions of many parents in this situation are often wrong. They might think, “We’ll let him slide this time; we’ll just negotiate with him later.” But they’re negotiating with the wrong person, because what this child wants more than anything is to maintain power and control—and unfortunately, his parents are handing it to him on a platter. Make no mistake, if your child is using power to solve relational, social or functional problems, he will never be able to get enough. This is because he’s being driven by insecurities and fears. There’s just not enough that you as a parent can ever give him—so your child will simply continue to challenge you more and more. If you want to get control back over all your children, you have to first get control of your dominant child. 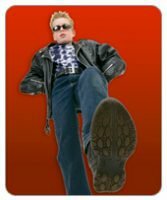 Even though your other kids may be acting out as well, your “alpha dog” kid is causing the imbalance in authority; consequently, he is the one you have to manage. While naturally you have to hold your other children accountable for their actions too, your priority right now is to address the behavior of your dominant child. That means that you have to give him consequences that he can’t undermine–and then you need to be firm and follow through on them. If your alpha dog child uses after school time to take over the house, change the routine. That might mean he’ll go to somebody else’s house when school gets out, where he will be supervised by an adult—or it might mean that your other kids will go elsewhere. The point is, if his controlling, bossy behavior is occurring around a certain time of day or in certain situations, work to break out of the pattern by changing things up. Limits have to be set, and this is often a good place to start if you can manage to do so. If you over-negotiate with a child who’s trying to be the boss, you’re giving him the message that he’s your equal. In my opinion, that’s not a good message for a child or adolescent to have who is already acting out. Soon he’ll start bargaining with you in order to behave appropriately. And believe me, there’s a big difference between motivating kids with a reward system versus bargaining with them. I think when you’re bargaining with your child, he’s often wearing you down until you give in. You end up saying, “Okay, as long as you behave, you can have your way.” In contrast, when you’re rewarding someone, it’s clear that you’re the one with the authority giving out the reward. Bargaining with your child isn’t effective because you’re still not in control in the way that you need to be with him. I don’t believe contracts are magic wands. But I do believe that if everybody understands what the game is and what the rules are, the chances of your child following those rules increase. In my experience working with kids, I’ve also found that if something is written down on paper, it becomes more real to them. So sit down and draw up a contract with your child that clearly defines what he has to do in certain key areas. It should state that if he complies with the contract, he will be rewarded—and it should specifically outline what those rewards will be. It should also be very clear what the consequences will be for competing with you as a parent. Here’s how that would play out. If your child is disrespectful and he’s told go to his room, as long as he complies, the matter is settled. The protocol once he gets to his room might be that he needs to stay there ten minutes, calm down, and talk to you about what he’s going to do differently next time. But if he refuses anywhere along the line, that’s when the consequences set in. If he starts to act out, you can say, “This is in our contract, and you agreed to it. Now hand me your iPod.” Remember, as kids get older, they want more sophisticated privileges and rewards. Going to school dances, going to parties, or driving the car are some examples. Use these for leverage. You should expect your child to react really strongly to the new structure you impose as soon as you establish it. Adolescents do not give up power easily. Your family may even go through some chaos for a time as your child fights against you. But you have to make that value judgment. Ask yourself, “Is it worth living like this, or is it worth going through some chaos for awhile to correct the situation?” Personally, I think parents have a responsibility to protect all their kids. And they need to protect them from everybody, including from each other—and from themselves. I think it’s good to reward positive behavior in your child whenever you see it. Use that hypodermic affection by saying, “Hey, I noticed you talking nicely to your little brother today. Good job.” You can build in some incentives by saying, “We know you want to feel like an older brother. So if you follow this plan, you can stay up an hour later than the other kids. You can watch TV and have the computer to yourself during that hour, but this is the way you have to act.” Use the carrot and the stick. There is nothing wrong with rewarding appropriate behavior. I think it’s important for parents to come up with a game plan that outlines how they’ll deal with their children. It should be a plan they’re both comfortable with. Parents have to meet and get clear about their message before presenting it to their kids. So if one parent tends to say things like, “Look, Will can’t help it, he has ADHD,” but the other parent says, “No, he’s responsible for his behavior just like the other kids are,” they’d better get that settled behind closed doors—or at least, they should know where they stand. Two parents who can’t get on the same page about how to hold their kids accountable can easily create that vacuum in power which their acting-out child will only be too happy to fill. If you’re a single parent, I think it’s important for you to keep the expectations for appropriate behavior very clear. In my opinion, all the kids should do more in a single parent family. They should have more responsibilities in general, and they should pitch in and help out. Often, there is an older child who has more responsibility, and I think in any family system, those who have more responsibility should have more rewards. 3. Manipulative Child Behavior? My Kids Are "Too Smart for Their Own Good"